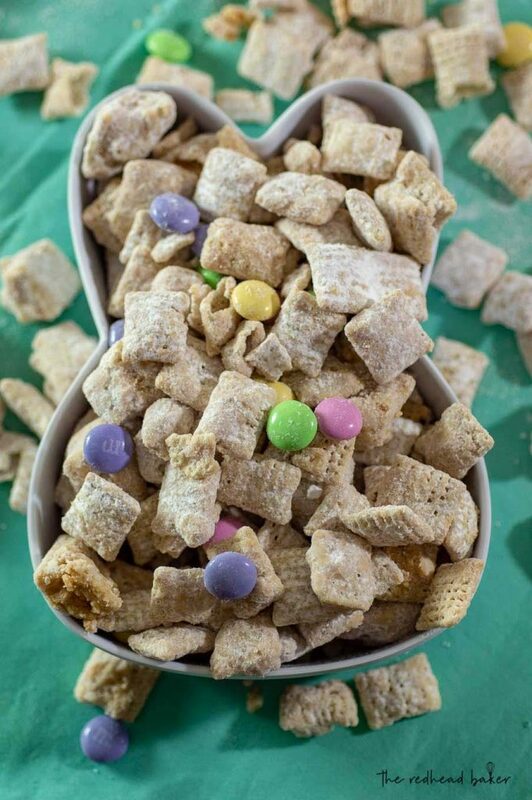 Lure the Easter Bunny to your house with this delicious Bunny Bait! 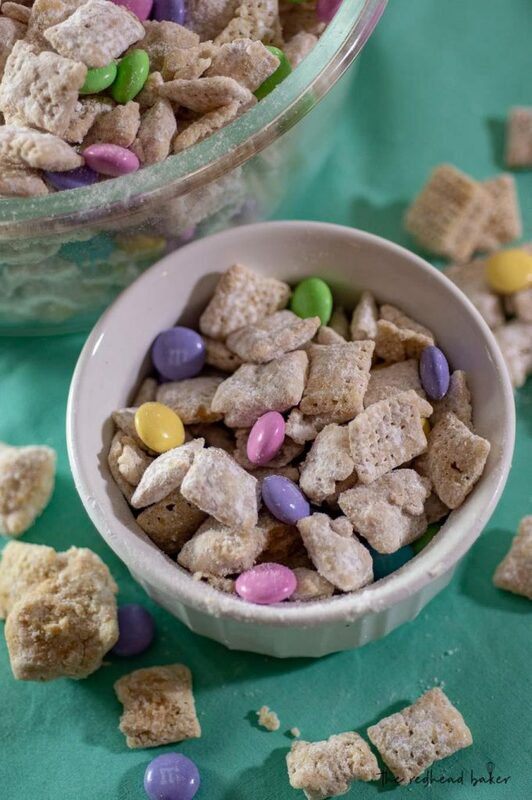 These white chocolate Muddy Buddies are mixed with pastel Easter candies. Warmer weather seems to have finally settled in for good in Philadelphia! That brings with it Little League season. My son is in AAA level this year, which means two evening practices each week, and at least one game each weekend. This leaves me with little time for pretty much anything besides work, which is why the blog has been quiet for a while. I hardly even get to cook dinner anymore! However, I’ve missed my kitchen, and put together this super-easy, super-sweet Easter treat. Muddy Buddies are totally addicting. If you’ve never had them before, they are Chex cereal coated in a mixture of chocolate (or in this case, white chocolate), peanut butter and butter, then tossed with powdered sugar. Then, you can add in whatever strikes your fancy, or something that fits a theme. 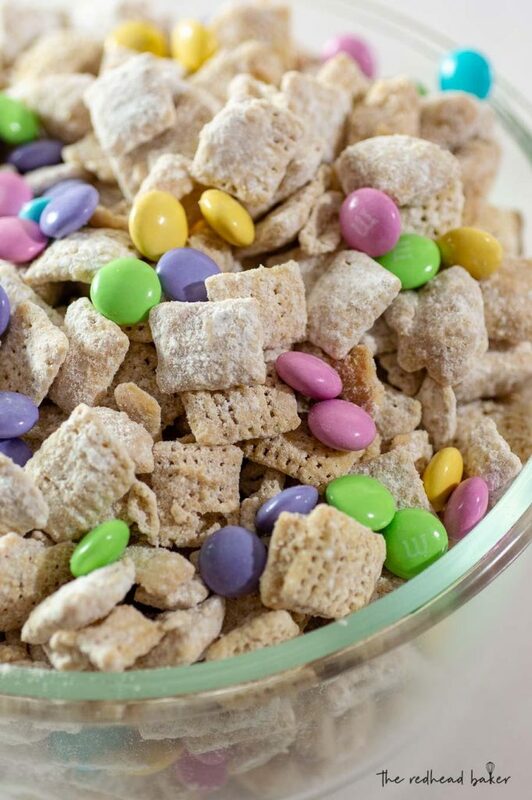 Since these muddy buddies are bait for the Easter Bunny, I added milk chocolate M&Ms in Easter colors. If you want even more peanut butter flavor, go ahead and add peanut butter M&Ms! Feel free to experiment with other Easter candies, too, like Cadbury mini eggs, Hershey’s mini chocolate eggs, or mini pastel marshmallows if you come across them. Personally, I’d avoid fruity candy in this recipe, but if your floats your boat, go for it. 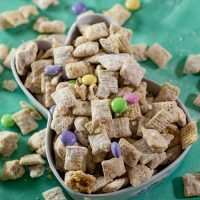 Muddy buddies are a great recipe to get kids started in the kitchen, too, since the only “cooking” is done in the microwave. Adults should still supervise, because the microwaved mixture can get very hot. Place the Chex cereal in a large mixing bowl. In a microwaveable container, combine the white chocolate chips, peanut butter and vanilla. Microwave on high in 30-second bursts, stirring between each interval, until the mixture is smooth (should take no longer than 1 min 30 seconds). Pour the mixture over the cereal, and use a spatula to gently mix the two, using a folding motion. Place half of the powdered sugar in a gallon-sized zip-top bag. Then add the coated cereal, then add the remaining powdered sugar. Seal the bag and gently shake to coat the cereal. 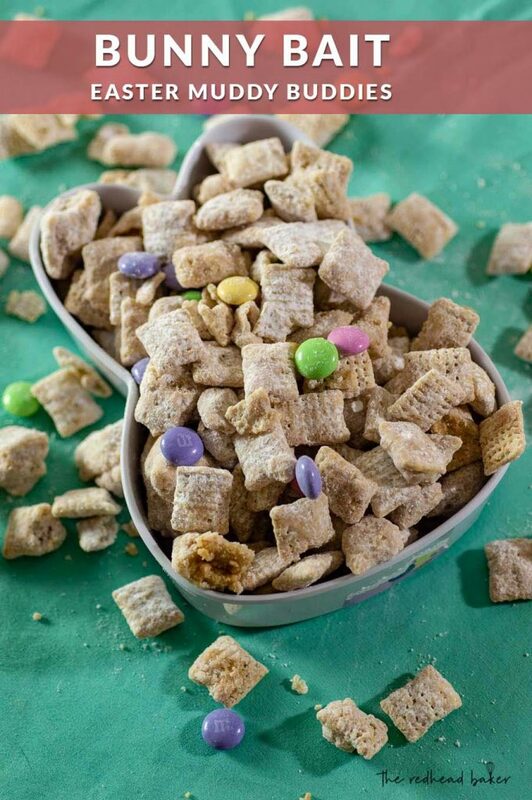 Spread the muddy buddies on a wax paper-lined sheet pan to cool for 30 minutes. Transfer the mixture into a zip-top bag or other airtight container. Add the Easter candies, gently mix, then seal and store at room temperature.